Jagan Institute of Management Studies organized an interactive session on “New Age Branding Solutions & Role of Internet in Real Estate Industry” on 13th October 2014 at its campus. The speakers of the session were Mr. Neeraj Sharma, SVP & Nitin Sharma, AVP, 99acres.com. 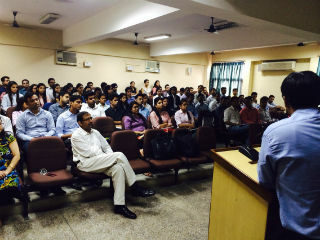 The session was organized for the PGDM, PGDM – IB & PGDM – RM students of 2014-2016 batches. Speaking on the topic, Mr. Nitin Sharma said “it is important to understand the role of internet in today’s real estate decisions and discussed the growth of E-Commerce industry and how it has evolved over the years. Further Mr. Nitin Sharma added, the real estate has made a vital presence online in the last ten years and has changed the shape of picture of buying and selling. With online portals coming into picture, the method of searching and buying a property has become very less tiring. According to a recent study by Google, over half of the real estate transactions are influenced by internet today. The numbers prove that internet has taken over the real estate market. The queries that come through internet devices have doubled over the years. Therefore, the increasing demand of online portals have changed the entire market scenario in terms of accessibility, comfort, multiple options, reasonable prices, thus this has resulted into massive shift from offline portals to online portals today. 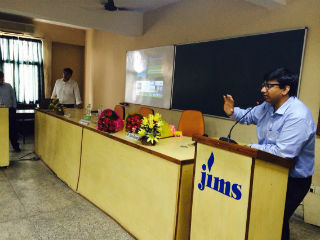 Lastly, Mr. Neeraj Sharma gave presentation on 99acres.com and role of online portal in Real Estate Industry. Overall it was a huge learning experience for the management students. The session was highly interactive and informative as a lot of students were inquisitive and had queries regarding the same.